IQS Directory is a top industrial directory listing of leading industrial bowl feeder manufacturers and suppliers. Access our comprehensive index to review and source bowl feeder manufacturers with preview ads and detailed product descriptions. These bowl feeder companies can design, engineer and manufacture bowl feeders to your specifications and application need. A quick and easy to use request for quote form is provided for you to contact these bowl feeder manufacturers and suppliers. Each company has detailed profile information, locations, phone number, website links, product videos and product information defined. Read customer reviews and product specific news articles. We are the right resource for your information requirement whether its for a manufacturer of vibratory bowl feeders, precision bowl feeders, spring bowl feeders. Eriez offers a worldwide network of manufacturing facilities and experienced, factory-trained representatives with six decades without a work stoppage. We are ready whenever you need us. Let Eriez help with the challenges of keeping your operation running smoothly and profitably. Contact us today for assistance with your next bowl feeders order. For more than sixty years Carrier Vibrating Equipment has been a leader in process solutions that can impact your business and keep your profits flowing! Here, they design and manufactures the highest quality equipment in the industry, making sure that the bowl feeders you receive are the best that can be found. Call today to learn more about the services and solutions Carrier offers. General Kinematics is now the preferred solutions provider of our competition. When other equipment suppliers can not get their equipment to work they call GK's customer service department to solve their equipment problems. With 50 years of solid development work behind us, we are able to offer customers the bowl feeders they need with unparalleled dependability and performance. For decades we have been committed to providing our customers with bowl feeders that will stand up against the wear and tear of everyday application in order to provide a lifetime of product service. Our technicians will work closely with you in order to come up with a product that will fit your exact specifications. For more information on how we may be able to assist you in keeping your business moving forward, visit us on the web today! Our company has many years of experience in the material handling industry. We offer a variety of products, including bowl feeders, parts feeders, and grizzly screens to our customers around the world. We believe that efficient designs lead to efficient and profitable products. That is why we are dedicated to offering you nothing but the best. Find out more when you contact us today! Bowl feeders are a type of vibratory feeder, which is a type of material conveyor and automation equipment that uses a vibrating drive in order to move things through the system. 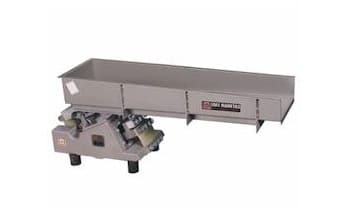 Bowl feeders, which were first invented in the 1950s, offer manufacturers the advantage of time and money saved, since they provide a cost-effective and simple alternative to manual labor or more complicated and expensive conveying systems. The benefits of bowl feeders are well known, which is why they are possibly the most common apparati used for parts feeding in the industrial manufacturing industry. They also serve a great number of other industries, such as: automotive manufacturing, chemical processing, electronics, food and beverage, foundry, glass, mining, packaging, pharmaceuticals, railroad and recycling. In the automotive industry manufacturers use bowl feeders in the sorting and inspecting a miscellaneous vehicle components. In the electronics industry, manufacturers use them in the sorting and orientation of various key parts of electrical components like pins, tubes and fasteners. In mining, bowl feeders are also used for sorting; this time, they sort metals, minerals and other mined materials. The pharmaceutical industry integrates bowl feeders into packaging systems, where they are used to sort and orient medicine and vitamins so that they can be properly packaged. To convey parts and materials along the system, bowl feeders use a feeder bowl, which is also known as a vibratory bowl, that contains a spiral track as well as the drive unit. With all of its components held in one place, the bowl feeder is a self-contained is a self-contained system. To make the whole system work, the drive unit produces vibrations, which causes the feeder bowl to vibrate. In turn, this motion moves the parts up the spiral track, which is designed to efficiently and properly sort and orient the parts in constant, repeatable positions and according to specific application requirements. When it is time for the parts to move on to the next step of the assembly process, they are conveyed along and discharged from an out feed accumulation track. Typically, a feeder bowl is mounted on top of the drive unit, a design choice that ensures that the feeder receives the vibrations in the most direct, effective and efficient matter. The drive unit usually creates vibrations with the help of a variable amplitude control box and either pneumatic power or electromagnetic power. When ordering a bowl feeder for their system, customers may request a device that perfectly fits their needs. For example, based on the needs of their application, they may order a track with a specific length, width and depth. In addition, customers may also order specially shaped bowls that help shake parts into the exact orientation they want. In doing so, customers will be able to make sure that the parts, products or materials they are sorting will fit well and that they will be able to be oriented and sorted in the most efficient way possible. Customers can also order their bowl feeders with material compositions that complement the material properties of their applications, configurations and compositions that will accommodate and support their product volume and weight. If they so choose, customers may additionally request additions like sound enclosures or sound covers, track coatings, base plates, sensors and hoppers. Enclosures, which are typically foam-lined structures, reduce the noise created by the feeder by absorbing it, and as a side benefit, they also protect against dust and other forms of contamination. Track coatings also offer noise reduction, but they are primarily applied to minimize wear and tear to the tracks and damage to parts. Base plates are used to make it easier to mount the drive unit to the machine bed, while sensors offer greater level control on a linear track. Finally, a hopper, which is a large bulk container, is an accessory that is added to a bowl feeder system in order to both store material and regulate incoming parts flow. Other types of feeders that are available to those in the market for feeders include centrifugal feeders (also known as rotary feeders), carpet feeders, linear feeders, step feeders and 3-axis vibration feeders. To find out what configurations work best for them, IQS recommends that interested parties turn to one or more experienced feeder manufacturers to guide, advise and work for them. Some of the best of the best can be found on this page. Learn about their services by browsing their respective websites, sending them a request for a quote or simply calling them.